In early 2013, the Department of Managed Health Care levied a $4 million fine against Kaiser for “serious” and “systemic” violations of state law in its mental health care services across California. Since then, the fine has been on hold because of an appeal initiated by Kaiser. But on September 8, Kaiser essentially admitted guilt. Rather than go through a appeals hearing, which would be open to the public, Kaiser decided to just pay the $4 million. 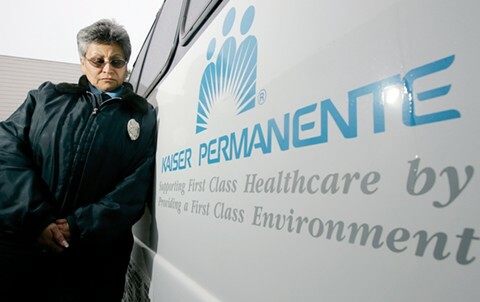 Kaiser may have chosen to pay the fine rather than go through the hearing because mental health clinicians from Kaiser hospitals were scheduled to give testimony about past and ongoing serious problems with Kaiser’s mental health services. These include, among other problems, long wait times for mental health appointments and patients being slotted into group therapy even when individual therapy would be clinically appropriate. What’s the next step? This fall the Department of Managed Health Care is planning to issue the results of follow-up survey assessing Kaiser’s efforts to fix problems with its mental health services. If the DMHC finds that problems persist, an additional fine can be levied and corrective actions will be required. 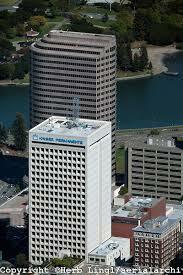 This recent development has been covered in several news outlets. 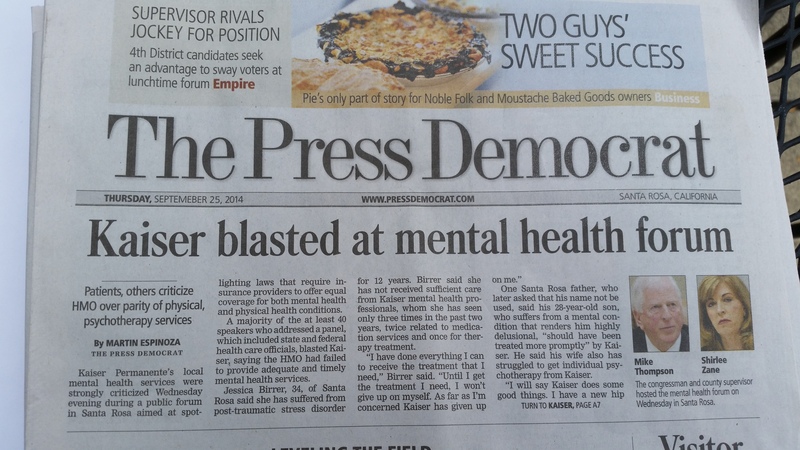 The following story was published in the Santa Rosa Press Democrat on September 10, 2014. To see all of the press coverage, click here: Press about the $4 Million Fine. 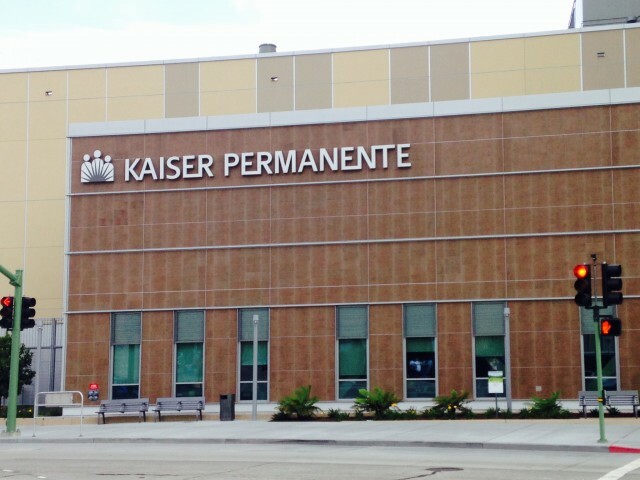 Ending a yearlong challenge, Kaiser Permanente will pay a $4 million fine levied by state regulators who accused the HMO of “serious deficiencies” in providing its members with timely access to mental health services. The state Department of Managed Health Care imposed the fine — the second-largest ever in the agency’s 14-year history — in June 2013. Regulators alleged Kaiser was not accurately tracking patients’ access to its therapists. The agency also said Kaiser could not ensure that patients were offered timely initial appointments with therapists for non-urgent matters, in violation of state regulations. Kaiser challenged the fine, saying it was excessive and unwarranted. 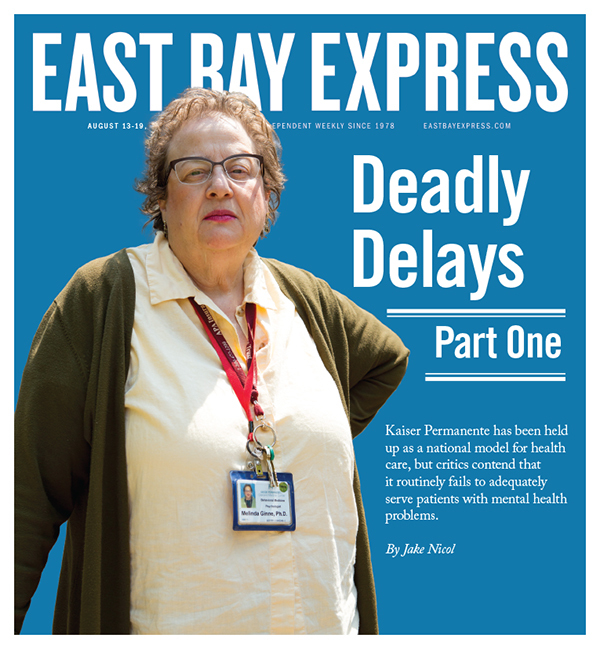 But it withdrew its appeal Monday night, hours before Kaiser representatives and state regulators were scheduled to give opening statements in a hearing Tuesday before an administrative law judge in Oakland. 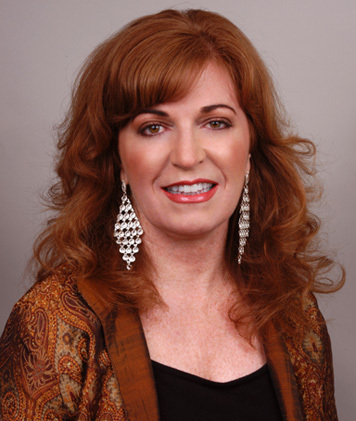 The Department of Managed Health Care is conducting a follow-up survey to determine whether Kaiser has corrected its alleged deficiencies and is complying with the law, said Shelley Rouillard, the agency’s director. This entry was posted in Department of Managed Health Care, Kaiser Permanente and tagged $4 million fine, department of managed health care, dmhc, kaiser, mental health on September 10, 2014 by The Kaiser Patient Advocate. “Marine Veteran Matthew Jensen and Shirlee Zane receiving California State NAMI awards…”‘We both share the same vision…to end suicide and remove stigma from mental illness…both Kaiser and the VA need to stop rationing care, provide parity or equal mental health treatment….saving 1,000’s of lives and preventing needless suffering. '” ~ Suervisor Zane (Sonoma County Gazette, August 1, 2014). This entry was posted in Kaiser Permanente and tagged kaiser, mental health, NAMI, Shirlee Zane, suicide on August 4, 2014 by The Kaiser Patient Advocate.